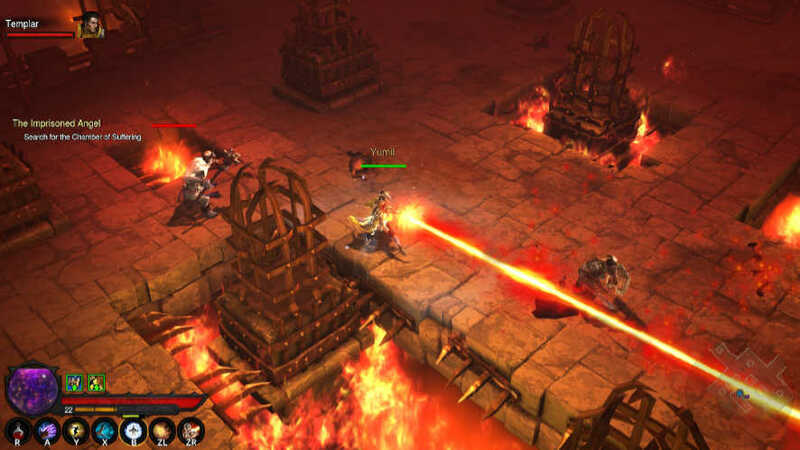 Diablo is a series that needs very little introduction, but, despite being one of the most famous video game series for PC, it has never been available on a Nintendo platform until now. Diablo III was recently released for Nintendo Switch, and even though I have played many other Blizzard games, I had never played Diablo for more than a few minutes, at least until now. I quickly learned that I had been missing out on something quite fun. Activision-Blizzard graciously provided a review copy for the Switch. Diablo III is an action RPG dungeon crawler. When you begin, you create a character and choose a character class. I like playing long-range magic-casting types, so I primarily played as a wizard. Other classes include barbarian, monk, necromancer, and others. You unlock new skills and modifications for those skills as you level up. In typical RPG fashion, you will gain levels and learn new abilities as you progress. 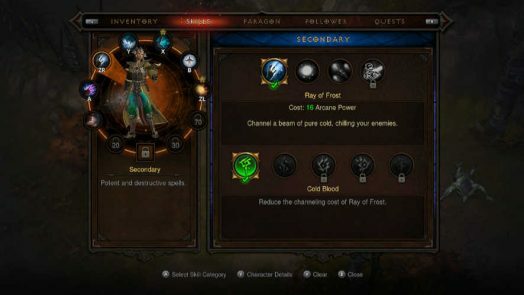 Diablo keeps the gameplay fresh by regularly giving you new abilities and only allowing you to keep a handful selected as a time. When you reach higher levels, you also unlock the ability to add secondary effects to abilities you already know. A simple example, the wizard’s force-push spell can be augmented to reflect enemy projectiles. Your character is further improved with new equipment and passive skills that you unlock as you increase your level. All of this is pretty standard fare for an action RPG. Diablo III provides a great amount of variety to keep the gameplay interesting. There is nothing extraordinary about the game systems, but they are well-made. 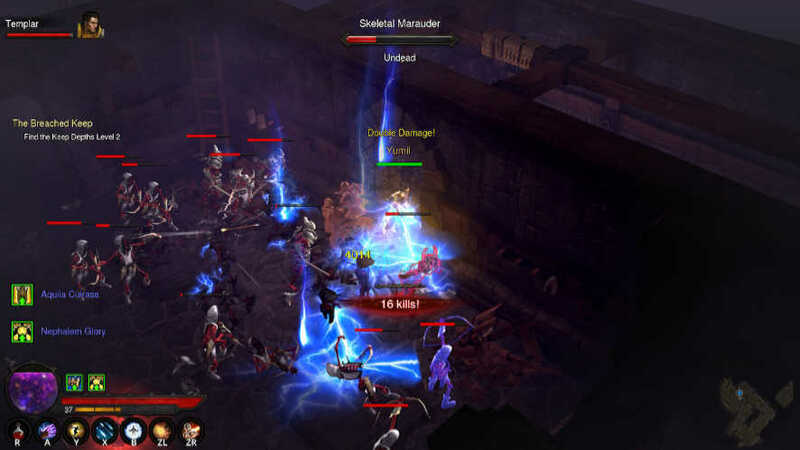 Diablo III‘s campaign is separated into five acts; the first four acts tell the main story and the fifth act is the expansion pack, Reaper of Souls, that continues shortly after the end of the main story. Each act tells a portion of the story and generally has a single theme. Act One is mostly graveyards and crypts while Act Three is mostly desert and desert caves and so on. The acts are a decent length, but they end before you get too tired of seeing the same kinds of areas. …but you’ll be in a fire-filled torture prison soon after. The enemy visuals are similarly varied, and I always seemed to be encountering something new. Even so, I generally felt overpowered for a good part of the game. It was hard to appreciate the visuals when the enemies were just constantly exploding in waves. Diablo III sends a lot of enemies at you, and it was always satisfying when I won. The action is fast paced with very little downtime in the middle of an act. I was generally happy with this approach, but it did mean that the story objectives remained very simple. More often than not, your objective is just to travel from point A to point B and kill whatever you find at the end. Occasionally I was tasked with defending something from waves of enemies. However, the gameplay is fun enough and the story doesn’t last long enough for it to feel repetitive. Furthermore, you always have the option to change your skills or play a different character class to add more variety to the gameplay. You are frequently surrounded by enemies. These battles are fast-paced, chaotic, and absolutely the most fun you will have while playing. The variety and customization available are what makes Diablo III stand out for me. The amount of customization available means that your character can be made your own. You can select your class, spells, augment those spells, select secondary abilities, and select the gear that best fits your play style. It’s unlikely that someone else would have the same character as you, and that gives the game a less cookie-cutter feel than some other games. I’m sure there’s a “best way” to play that gives the best results if you really want to look it up, but, for a casual player just looking to have fun, I found that I was able to make whatever changes I wanted without ruining the experience. Playing through the story is almost always my favorite part of a video game, and the same is true of Diablo III. However, once the campaign is over, you can still play “Adventure Mode” and experience an endless number of procedurally-generated levels called “rifts.” You can create new characters to try all the different classes, adjust your skills repeatedly, and continue battling to acquire new equipment for each character. It’s a style of gameplay that I find enjoyable, but it’s not for everyone. If you do enjoy a loot-grind, there’s tons of content to explore. 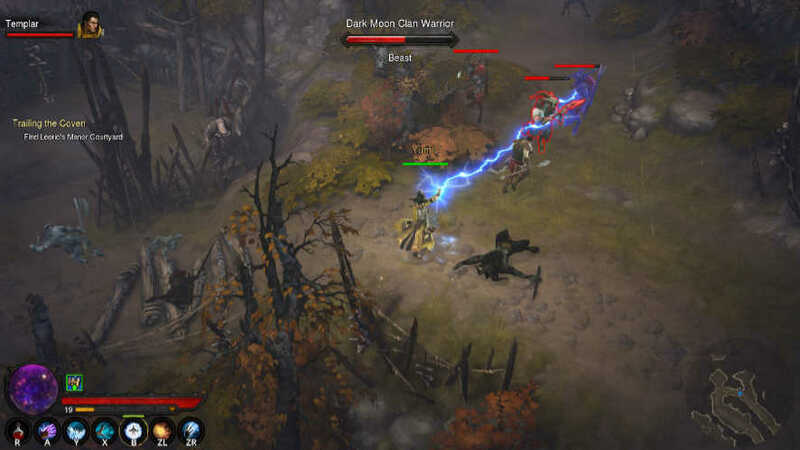 Diablo III adds additional replay value by including both local and online multiplayer modes, so you can experience the same rifts with a team. When you look at all of the content combined, Diablo III has the potential to provide a nearly endless amount of play time. I tend to move on from one game to the next fairly quickly, so I have not taken a deep dive into everything the game has to offer, but I enjoyed my time with the game and fully expect to revisit it in the future. I really enjoyed playing Diablo III; The entire experience was just a lot of fun throughout. However, there was one Switch exclusive feature that definitely did not live up to my expectations: the exclusive Legend of Zelda crossover items. On one hand, all of Zelda crossover items are given to you near the very beginning of the game for free, and that is very nice. On the other hand, anyone who, like me, is dreaming of playing through the entire game dressed as Ganondorf will be severely disappointed. The major Zelda item is the Ganondorf outfit, and it is very cool. The outfit is a “transmog” set. Transmogrification is a game mechanic that lets you change the visual appearance of a piece of equipment to look like another piece of equipment. The appearance is tied to a specific piece of equipment, so when you replace your pants with a better pair, you have to speak to an NPC in town again to reapply the appearance. 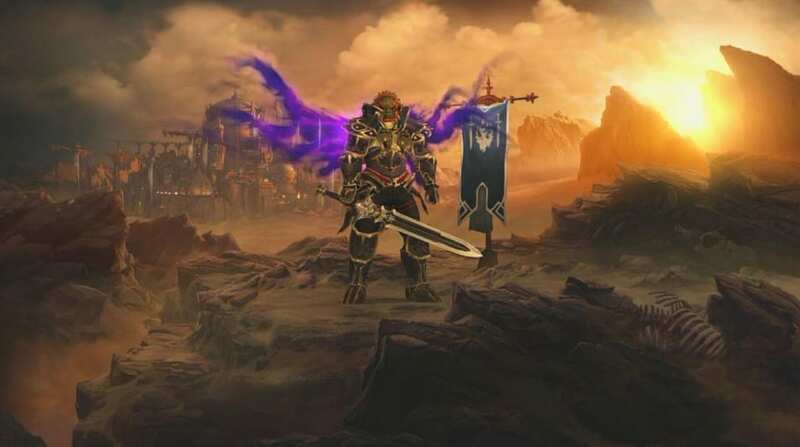 Diablo throws new gear at your left and right, so this would get annoying pretty quick on its own if you just want to look like Ganondorf all the time. Unfortunately, there is a bigger problem that prevents the Ganondorf dream from happening at all: applying appearances to gear costs in-game gold. It’s not cheap either: 20,000 gold per piece. You need well over 100,000 gold to look like Ganondorf one time. Blizzard never promised that I would be able to look like Ganondorf all the time, and the other armor sets are nice enough. It was just a bummer at the beginning when I realized that I couldn’t really be the King of Evil for the entire game. The other Zelda inspired pieces are less impressive. There are a set of wings, which are purely cosmetic. They look cool and are supposedly Majora’s Mask themed, but I have no idea what makes them Zelda-related. They’re just some nifty looking wings. Next is a Cucco companion who follows you around. It doesn’t do anything; it just follows you around. It’s cute, I guess. Last, there’s a Triforce-themed character portrait border. These are all nice-to-have exclusive additions to the Nintendo Switch version of the game, but if you’re a Zelda fan who is only interested in Diablo III because of the Zelda items, you will be disappointed. Diablo III is a fantastic game; it is one of the best I have played in the last year. The Nintendo Switch version is a port that has little to offer that wasn’t already available on PC, and that can make it difficult to recommend to anyone who played it before. The new features are the Zelda-inspired items, local multiplayer, and the portability that comes with being a Switch game. But if you haven’t played Diablo III before, the Switch release is a great opportunity to finally give it a shot. This was my first real experience with Diablo, and when the campaign was over I immediately joined the fans waiting for Diablo IV and an HD remake of Diablo II. The Switch has a growing library of excellent games, both new and old, that are constantly shifting our attention te whatever is new this week, but Diablo III deserves more time in the spotlight.